Last summer Channel 4 worked with Time to Change, Mind and Rethink Mental Illness on a season of programming aimed at challenging mental health stigma and discrimination – 4 Goes Mad. 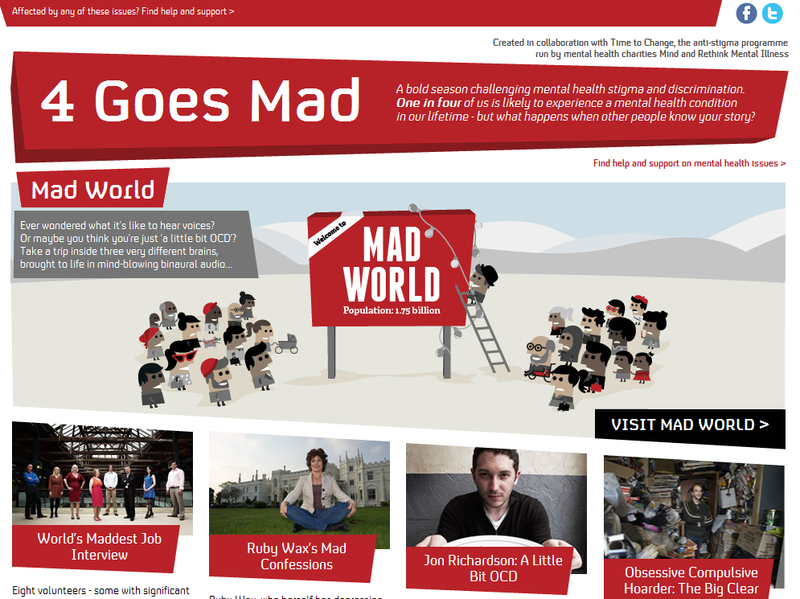 It was a joint effort; we wanted to make sure mental illness was portrayed sensitively and accurately. We need to break down stereotypes and this was an excellent opportunity to get our messages to a wider audience. The media teams from the three organisations developed relationships with Channel 4 and worked to advise the research and production teams for the season, with the digital teams getting involved towards the end of the process. There was controversy around the title, but Time to Change turned it around by asking its social media audience what they would have called the season instead? By engaging the mental health community beforehand, they had the chance to air their grievances and start a debate so when the season started, conversations weren’t taken off on a tangent about language and could focus on the content in the shows. During the season, we found people dual-screened during the programmes and stayed on social media after they had ended, continuing the discussion. On the first two nights the shows trended on Twitter, and we all saw uplift in our social media engagement. We worked together well with different angles and blogs and shared messaging with each other. Top learning for digital comms: If you invest time in joining conversations happening around large TV events, you’ll be joining not only your own community as they debate the subject, but a whole new audience who are interested in or curious about your cause. Tweet and post on Facebook as if you are sitting on the sofa with all of these other people and they’ll talk with you and find out more about what you have to say. Most challenging moment: A few seconds before the programmes were aired each night, as we couldn’t be sure how they would handle the subject of mental health and stigma – would they be sensitive? Would they be sensationalist? Would the content be distressing? Can we tweet fast enough to catch what’s happening?! Most heartening moment: When new followers tweeted us to say they felt encouraged to ‘come out’ about their experiences of mental illness after realising they’re not alone and they don’t need to be ashamed any more. Top learning for digital comms: Quite how draining it can be to live-tweet non-stop for just over an hour, you’re having tiny conversations with dozens of people, overhearing others, and wondering what everyone is thinking. It’s like being at an intense party, while also trying to follow what’s on TV! Most challenging moment: Making sure everything was in place. We wanted to remind our followers on Twitter and Facebook when the shows were going out, and putting out polls immediately after each show. Most heartening moment: That ‘intense party’ feeling was really great, I’ve never taken part in a digital event which had such an immediate sense of being in among hundreds of people in a community, all sharing experiences and opinions freely and engaging with new people. I think even when people were critical of the shows, everyone felt positive about the online discussion itself. Top learning for digital comms: Preparing the key messages in advance and getting social media people prepped and ready for each show. We had a different person on @Mindcharity for each show, with another one as backup in case it got too busy. Most challenging moment: Dealing with the number of tweets was really hard, especially when people were sharing some pretty tough experiences. Most heartening moment: People on Twitter who changed their mind about Obsessive Compulsive Disorder (OCD) and vowed not to use it loosely again. Former digital manager at Mind, Taryn is now digital media advisor at C&K in Brisbane, Australia.